It is also tangible proof of Dubai’s growing role in a changing world. In fewer than 30 years, this city has transformed itself from a regional centre to a global one. This success was not based on oil reserves, but on reserves of human talent, ingenuity and initiative. Burj Khalifa embodies that vision. 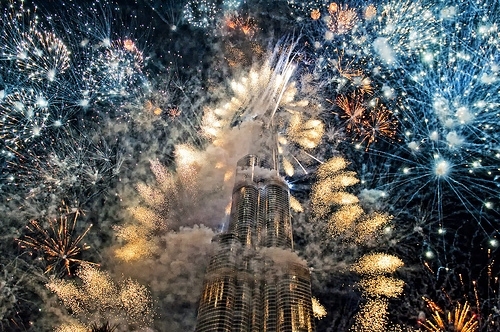 Mr Mohamed Alabbar, Chairman, Emaar Properties, said: “Burj Khalifa goes beyond its imposing physical specifications. 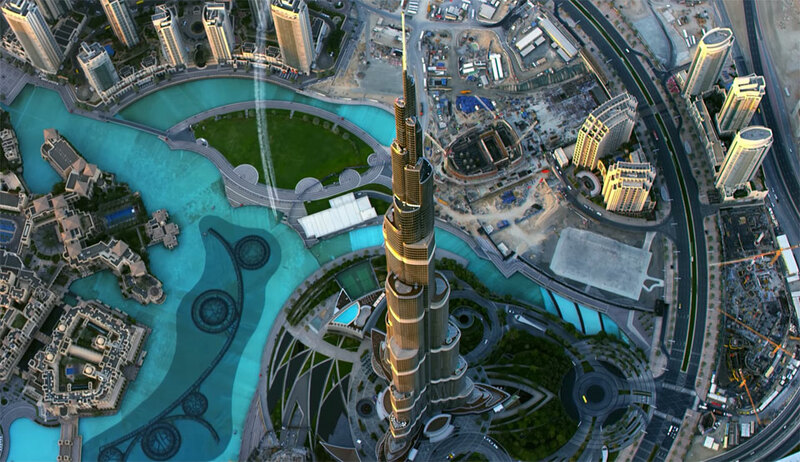 In Burj Khalifa, we see the triumph of Dubai’s vision of attaining the seemingly impossible and setting new benchmarks. It is a source of inspiration for every one of us in Emaar. The project is a declaration of the emirate’s capabilities and of the resolve of its leaders and people to work hand in hand on truly awe-inspiring projects. Emaar had but one inspiration, the unflagging enthusiasm set in motion by His Highness Sheikh Mohammed Bin Rashid Al Maktoum, Vice President and Prime Minister of the UAE and Ruler of Dubai, who inspires us to reach for the stars. Over 45,000 m3 (58,900 cu yd) of concrete, weighing more than 110,000 tonnes were used to construct the concrete and steel foundation, which features 192 piles buried more than 50 m (164 ft) deep. Burj Khalifa’s construction will have used 330,000 m3 (431,600 cu yd) of concrete and 39,000 tonnes (43,000 ST; 38,000 LT) of steel rebar, and construction will have taken 22 million man-hours. 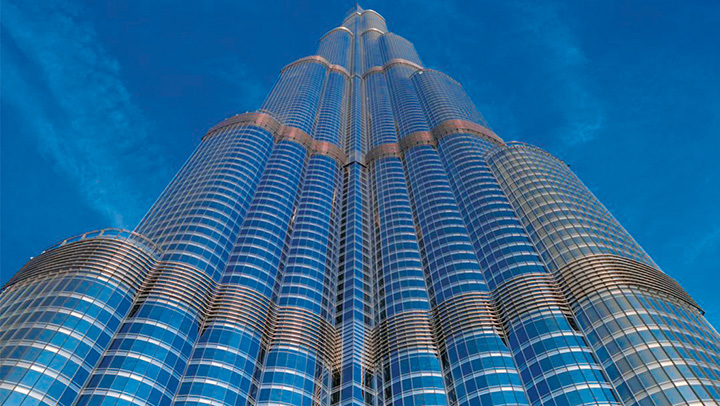 Exterior cladding of Burj Khalifa began in May 2007 and was completed in September 2009. The vast project involved more than 380 skilled engineers and on-site technicians. At the initial stage of installation, the team progressed at the rate of about 20 to 30 panels per day and eventually achieved as many as 175 panels per day. The tower accomplished a world record for the highest installation of an aluminium and glass façade, at a height of 512 metres. The total weight of aluminium used on Burj Khalifa is equivalent to that of five A380 aircraft and the total length of stainless steel bull nose fins is 293 times the height of Eiffel Tower in Paris. In November, 2007, the highest reinforced concrete corewalls were pumped using 80 MPa concrete from ground level; a vertical height of 601 metres. Smashing the previous pumping record on a building of 470m on the Taipei 101; the world’s second tallest tower and the previous world record for vertical pumping of 532 metres for an extension to the Riva del Garda Hydroelectric Power Plant in 1994. The concrete pressure during pumping to this level was nearly 200 bars. The amount of rebar used for the tower is 31,400 metric tons – laid end to end this would extend over a quarter of the way around the world. At the peak of construction, over 12,000 workers and contractors were on site everyday, representing more than 100 nationalities.